Smashing and tasting coconut drifted ashore! 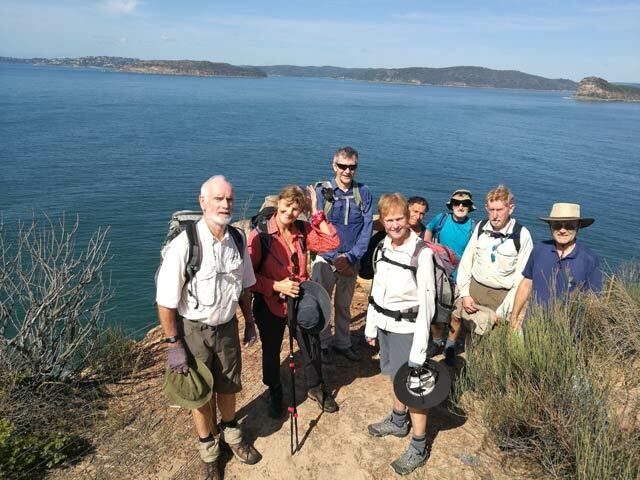 Bouddi National Park on the Central Coast was declared in 1935 after an active conservation campaign by bushwalkers and environmentalists, with The Bush Club’s joint founder Marie Byles taking a leading role. She is honoured in the park with the Marie Byles Lookout where the group photo was taken. She was the first practising female solicitor in NSW, an active campaigner for women’s rights and interests, a world traveller, trekker and mountain climber, as well as a promoter of Buddhism with 4 books to her credit. 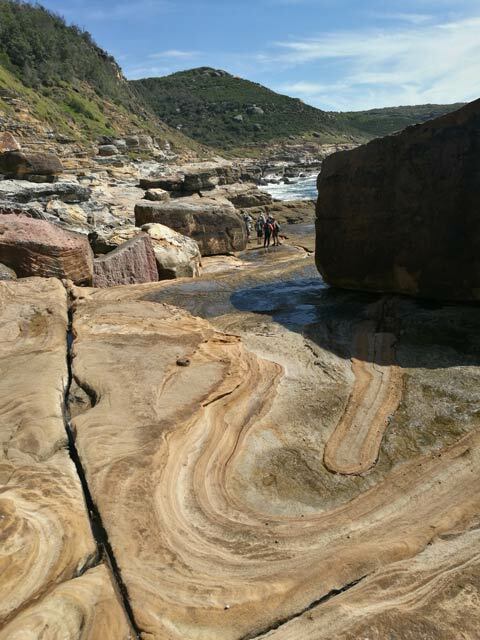 The programmed walk covered the length of the coastal part of the park, with spectacular views of headlands, secluded beaches, rainforests and heathlands, as well as some challenging rocky climbs and mildly-exposed scrambles. The walk was preceded by a Cook’s Tour of a bus trip from Woy Woy to Wagstaffe Store, via Umina Beach, Rip Bridge, St Huberts Island and Empire Bay. This particular trip did not require the usual stop to allow ducks and ducklings to cross at designated spots. From near the Wagstaffe Store, we set off up the hill and behind the houses to join up with the Flannel Flower track. 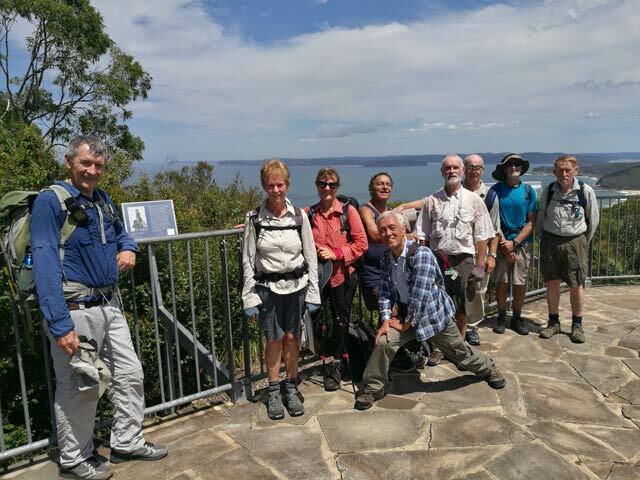 That track was developed by Parks to direct walkers away from encroaching on private holdings – this is fortuitous as the track offers spectacular views over Broken Bay and towards the Northern Beaches of Sydney. 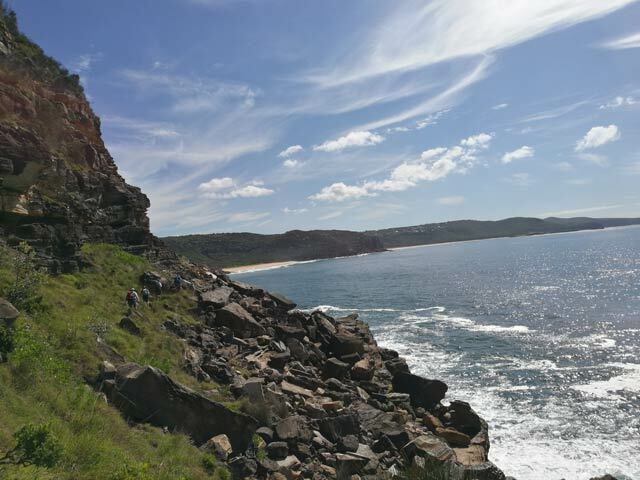 It joins up with the Box Head track heading due south – Box Head is the northern entrance to Broken Bay, and has panoramic views over the Tasman Sea, Barrenjoey Headland, Lion Island and Broken Bay. From the west side of the lookout, there is a rough way down and around the Head, used by rock fishermen, with some mild exposure. Eventually you can work your way down to relatively flat rock shelves. These shelves can be a problem at high tide – the walk was programmed for low tide at this point for this reason. 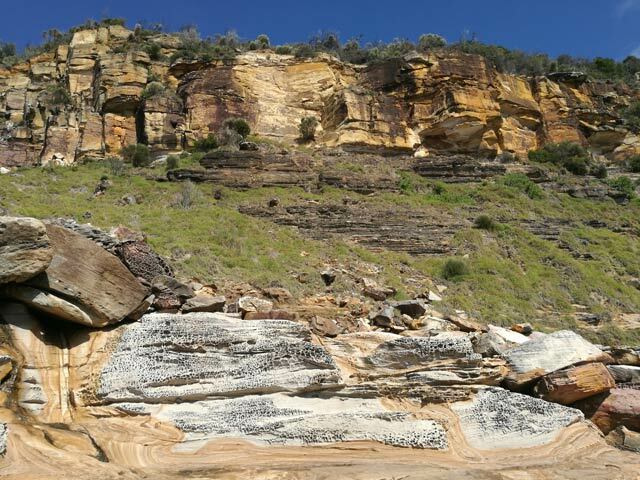 From the rock shelves a well worn track heads through low heath to Little Tallow Beach – this beach is a small 50m stretch of sand, wedged into a rocky outcrop and backed by a steep gully and rocky headwalls. From Little Tallow Beach, the track climbs uphill through heath to join a management trail heading down to Tallow Beach. 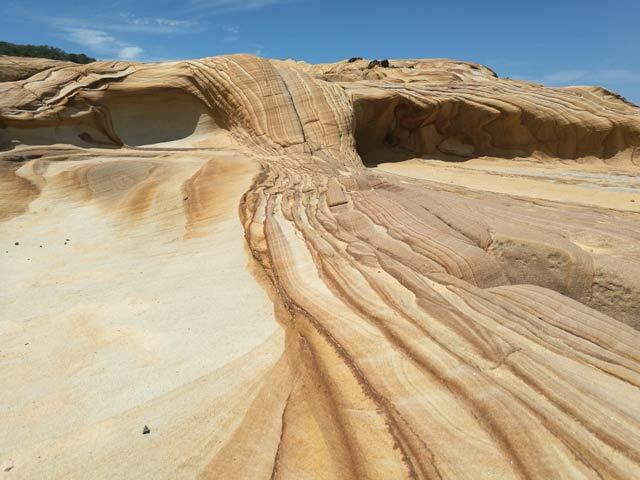 A “missing link” for a truly coastal walk in Bouddi is between Tallow Beach and Putty Beach. While it is possible at low tide to rock hop around the headland, this has dangers with slippery rocks and certain spots subject to swell even at low tide. 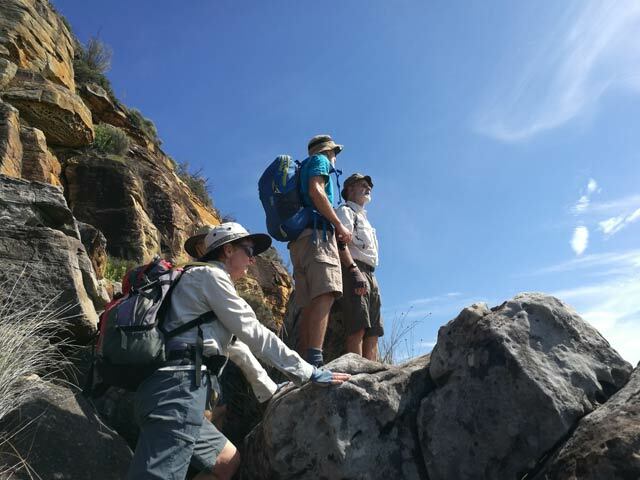 Due to time pressures the group forewent a side trip to Tallow Beach, instead heading uphill to join the ridge trail heading generally north east, which becomes Hawk Head Drive. Time for morning tea – we were able to find spots near the gates that satisfied the need for shade, views and breeze. Hawk Head Drive eventually heads into Hardy Bay from where we followed Grandview Crescent and worked our way down to Killcare & Putty Beaches. 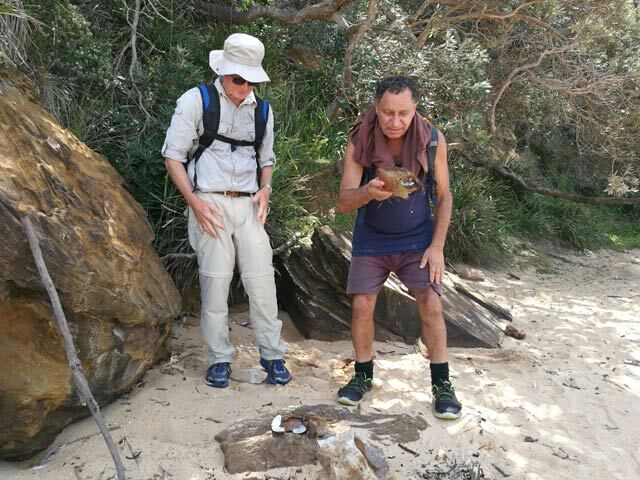 At the north-eastern end of Putty Beach, is a stairway to the start of the formal ‘Bouddi Coastal Walk’ with its walkways, boardwalks and marked tracks. We followed the walk past the Tessellated Pavement and Bullimah Beach to Gerrin Point with its spectacular views over Maitland Bay. Not far after Gerrin Point, beside some boulders, is the start of the connecting track to Bullimah Spur. This is a challenging climb with sections of rock scrambling and with an in situ rope at one point. 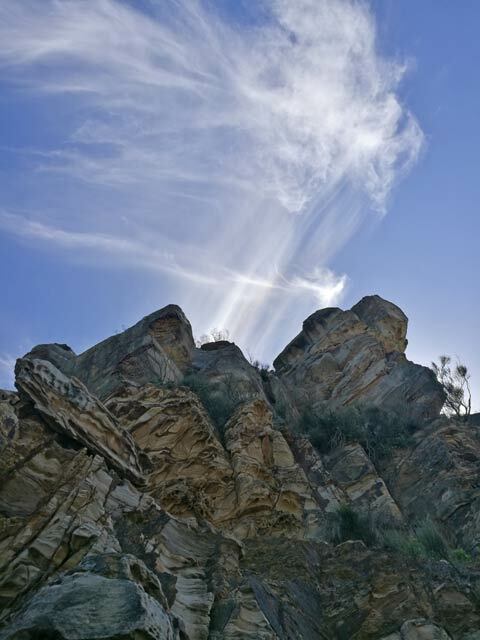 However, the climb is well worth the effort with marvellous views and interesting vegetation along the Bullimah Spur track – orange-barked Angophoras, Burrawangs (cycads), and Xanthorrhoeas (grass trees). A side track from the Bullimah Spur track took us to Marie Byles Lookout, and our group photo shot. From there we made our way to the taps near the Information Centre, to replenish our water, and then took the Maitland Bay track to the bay for lunch. After lunch it was a matter of following the coastal walk via a number of “undulations” (including Cave Gully) to the Little Beach camping area, and from there to the suburb of MacMasters Beach. From Beachview Esplanade beside Number 51, the MacMasters Beach Walking Track heads towards the coast to join Macmaster Parade, and from beside number 37, a walkway drops down to Marine Parade and MacMasters Beach. Then beach walking along MacMasters past Cockrone Lagoon and onto Copacabana Beach. We arrived early for the 5:20 pm bus to Gosford so walkers had time for ice-creams and/or cold drinks from the shops and in one case a quick swim at the beach. Distance 21 km, Cumulative climbs 810m, Maximum climb 155m, Walking time 5.5 hours.